Although social media bots largely have a negative connotation among the public, certain uses of bots seem to be more acceptable than others. Those who have heard about bots were asked about a mix of nine ways that social media bots are used. Topping the list of supported uses: government agencies using bots to post emergency updates. About eight-in-ten of those who have heard about bots (78%) find this practice to be acceptable. On the flip side, there is solid opposition to an organization or individual using bots to share false information, with 92% of those who have heard of bots saying this is not acceptable. Strong majorities also oppose a celebrity using bots to gain more social media followers (67%) and a political party using bots to share information that favors or disfavors one candidate (75%). When it comes to an issue-based group using bots for a political purpose – to draw attention to a specific topic – opposition is not as strong as to a political party using bots, though more people still find it unacceptable (57%) than acceptable (42%). The public is more split for the remaining uses. At least half of those who have heard about social media bots find the two business-related uses acceptable: businesses using bots to promote products (55%) and respond to customers’ questions (53%). Similarly, the public is about evenly split on whether news organizations’ use of bots to post headlines or news stories is acceptable or not (50% find it acceptable and 49% find it unacceptable). And when it comes to an individual using bots to share pictures or quotes, about equal shares of those who have heard of bots find it acceptable (48%) as unacceptable (50%). Americans who have heard more about social media bots are less likely to be supportive of a number of their uses. This is true for the two politics-related uses. Those who have heard a lot about bots are 10 percentage points less likely than those who have heard some or not much about bots to say an issue-based group using bots to draw attention to a specific topic is acceptable (34% and 44%, respectively). 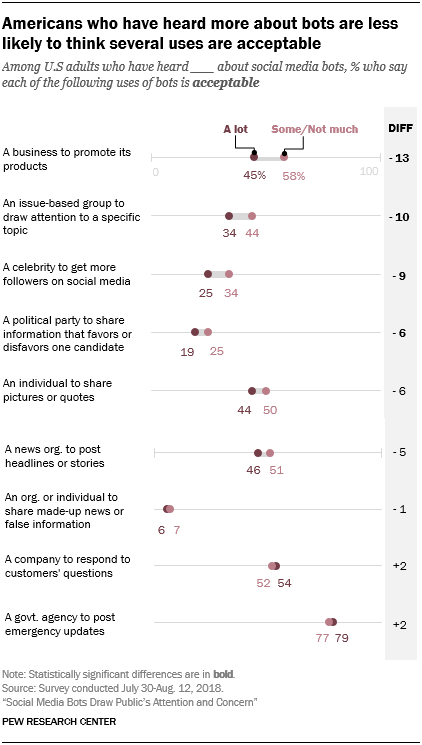 Similarly, those who have heard a lot about bots are less supportive of a political party using bots to share information that favors or disfavors one candidate, compared with those who haven’t heard as much about bots (19% and 25%, respectively). Awareness about social media bots also influences views on two uses that help people or organizations promote themselves. For instance, a business using bots to promote its products is considered acceptable by 45% of those who have heard a lot about bots, compared with 58% of those who have heard less about them – a 13-point gap. And there is a 9-point gap when it comes to a celebrity using bots to get more social media followers.